This intriguing half-day adventure begins with a short drive across the bridge to Japonski Island. At a decommissioned Naval Base your friendly guides will help you get fitted with gear before presenting a short kayak & safety orientation. Then set out on a leisurely guided paddle through Sitka’s picturesque harbor, home to one of the most productive commercial fishing fleets in North America. After you have settled into your own paddling rhythm, we’ll head out past the breakwater to explore the wild edge of Sitka Sound. You’ll be amazed by the abundance of colorful marine life that inhabits the intertidal zone and kelp forests that fringe the coast. 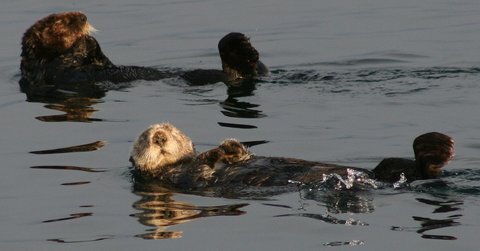 With bald eagles watching over us from the trees, it is almost certain that we’ll see some of our other wild neighbors: curious harbor seals, massive steller sea lions and perhaps a few playful sea otters. Occasionally, we even sight humpback, minke or orca whales. At the Causeway Islands we’ll step ashore to explore the remains of a WWII-era fort, which had been hastily abandoned as quickly as it had been built. While exploring moss-covered bunkers and fern-rimmed gun emplacements you can almost feel the healing power of the rainforest; the utter peacefulness of the lush surroundings presents such a peculiar contrast to the intent of these abandoned structures. We’ll enjoy a snack and refreshment on the beach, and tell a few stories, before starting the paddle back to Sitka.